If you suffer with knee pain that just won't go away, this may be the most important message you'll ever read. Why? Because of a new breakthrough that's far more effective than anything else I've seen for aching knees. Thanks to this breakthrough, you can experience fast, soothing relief - even if your knees have been hurting for years. Thanks to this breakthrough, you can walk, climb stairs, and even run with ease - without suffering any stiffness, swelling, or discomfort later. In fact, you can enjoy all your favorite activities again…virtually pain free. What's more, studies show that this new breakthrough is safe, fast-acting and inexpensive. Plus, its pain-soothing benefits are long lasting! So what is this new breakthrough that works wonders for knee pain? When I tell you its name, you'll probably be surprised. It's actually a new form of an old remedy that's been around for hundreds of years. Scientists have now discovered a way to make it much more concentrated.....and much more powerful. The active ingredient in white willow bark is a compound called salicin. Traditional white willow bark contains just 15% salicin. But now, scientists have recently created a new form of white willow bark that contains a whopping 50% salicin. This extra-strength white willow breakthrough makes all the difference. Patients of mine who suffered for years with stiff, aching knees became pain free, thanks to this ultra-concentrated form of the herb! But my patients weren't the only ones who enjoyed these astounding results. Clinical studies found the same thing. In one study, scientists divided 210 people with pain into 2 groups. One group took 240 mg of salicin from white willow bark twice a day. The second group took a placebo. At the end of the 4-week study, the group taking the willow bark experienced significant relief in their pain…and remained pain-free for at least five days of the study. In contrast, only 6% of those given placebo felt some amount of pain relief. This extra-strength white willow bark works fast, too. In a 2-week study, people taking the concentrated white willow bark experienced significant relief in their knee pain—as well as less swelling and better flexibility. Meanwhile, the placebo group saw their knee pain actually increase. And here's even better news: this white willow bark breakthrough isn't only good for pain relief. It also contains flavonoids and antioxidants that protect your cartilage, support your knee joints, and even help your cells to repair and protect themselves from further damage! I'm convinced this new form of white willow bark is one of the most effective natural solutions yet for easing knee pain, swelling and inflammation. Once I read this research, I wanted to get it into the hands of my patients and readers as soon as possible. Announcing Ultimate Knee Relief. The first formula I know of designed to ease the pain and stiffness of the hardest-working joint in your body! So I contacted the research team at Advanced Bionutritionals. Together, we developed a formula to target stubborn knee pain. It's called Ultimate Knee Relief. This exclusive formula contains 480 mg of this superior form of white willow bark—concentrated to contain 50% salicin. This is the exact form and dosage used in the clinical studies, so you can experience the best results. Plus, it's well-tolerated and won't tear up your stomach, even if you take it over a long period of time. But we didn't stop there. Since knee pain is so stubborn, we wanted to make sure Ultimate Knee Relief worked for the greatest number of people possible. So we added 5 additional pain-soothers - all in their strongest, most advanced forms. Plus, we include them in the precise levels shown in studies to deliver the soothing comfort you deserve. Together, these ingredients work fast to help alleviate your pain, improve your mobility, and rebuild aging knees - all at the same time! "60% improvement in pain relief over regular turmeric…"
Let me tell you about the next pain stopper in Ultimate Knee Relief now. It's a more effective, advanced form of turmeric. Turmeric is rich in compounds called curcuminoids, substances which block the overproduction of the enzymes that trigger knee pain. It's also a powerful antioxidant, so it defends against free radical damage that hurts your joints. Turmeric is an effective anti-inflammatory, too. However, Ultimate Knee Relief doesn't contain ordinary turmeric. You see, while turmeric is quite effective for easing pain, it doesn't absorb very well. And since it's water-soluble, turmeric goes through your body very quickly. It only lasts about 3 hours, and then you have to take more. Fortunately, scientists discovered a way to make turmeric fat-soluble, so it stays in your body longer. They found that if you attach turmeric to tiny little fatty molecules called phospholipids, far more turmeric can reach your aching joints. That's because the phospholipids act as a "shuttle" moving the turmeric through cell membranes and into your tissues. This next-generation form of turmeric is called Meriva®. And it delivers far more relief than the "old" version of the nutrient! In one study, scientists divided a group of patients into two groups. One group was given Meriva® turmeric, and the other group was given a placebo. At the end of the 3 month study, scientists knew the group taking Meriva would experience some amount of improvement. But they couldn't believe how dramatic the results would be! 63% of patients were able to lower their use of other remedies. 38% of patients reported less stomach upset. Patients were able to walk 3 times farther on treadmill tests. Compare this to the placebo group, who experienced little reduction in their inflammation, pain and stiffness. With results like these, we knew we had to add Meriva to Ultimate Knee Relief. We included 200 mg of Meriva®, the exact same dosage used in the clinical studies. And that's not all. There's another ingredient that makes Ultimate Knee Relief better and more unique than other joint solutions. You may have heard about COX-2 and 5-LOX, two nasty enzymes that cause swelling and discomfort. But there's another hidden pain enzyme that may be even worse. It's called MMP-3. MMP-3 actually eats away at the cartilage in your knees. It completely destroys the joint tissue. MMP-3 is such a nasty enzyme that even just a tiny bit can cause agonizing pain. And when MMP-3 runs wild, your risk of other health problems skyrockets as well. That swelling, stiffness and persistent ache that just doesn't go away, no matter what you do. The cause is MMP-3. MMP-3 is a huge problem, but sadly, most natural joint remedies do little to address it. But do you know what helps neutralize MMP-3? There's an inexpensive herb that does a fine job. That herb is boswellia. Boswellia has been the subject of hundreds of studies as a super-powered anti-inflammatory. Knowledge of its healing power dates back to Biblical times. In fact, the Boswellia sacra tree is the source of frankincense, one of the gifts of the Magi to the infant Jesus. Today, we know why boswellia works so well to relieve knee pain. The tree yields a gummy resin packed with boswellic acid. Boswellic acid increases blood flow to your joints and helps stop the nasty MMP-3 enzyme in its tracks. Plus, boswellic acid also neutralizes other pain enzymes, including Cox-2 and 5-Lox. That's why boswellia is one of the best herbs to deliver soothing comfort and improved flexibility. As good as boswellia is, scientists have found a way to make it work even better. They recently formulated a modern extract of boswellia that contains 60 times the usual amount of boswellic acid. It's called Super Boswellia. And it delivers clinically-proven relief from knee pain! "52% improvement in knee pain and stiffness"
In one study, doctors selected volunteers with mild to severe knee pain and divided them into three groups. One group received 100 mg/day of Super Boswellia. The second group received 250 mg/day. The last group was given a placebo. At the end of the study, the group taking the 100 mg dose of Super Boswellia experienced an impressive 40% improvement in knee comfort. The group taking the 250 mg dose did even better. They saw a remarkable 52% improvement in their knee pain and stiffness. This is unheard of for a natural remedy! Plus, both groups taking Super Boswellia noticed significantly improved joint function, as well. But that's not all. Not only did Super Boswellia work better, it worked faster. Much faster. Patients were nearly pain-free just 5 days after taking it! Super Boswellia is one of the most potent natural MMP-3 inhibitors you can find - and it's one of the absolutely essential ingredients in Ultimate Knee Relief. Ultimate Knee Relief contains 200 mg of Super Boswellia as well as this next knee-soother. It's a trace mineral essential for improving joint and bone health. Yet it's woefully lacking in the American diet. And multivitamins don't contain the amounts you need either! This trace mineral helps your body absorb more calcium into your bones. So it helps increase bone density and strength … while slowing down bone loss, too. This mineral also acts as natural anti-inflammatory that helps ease swelling and discomfort. Plus, it promotes healthy levels of synovial fluid, the cushioning fluid that helps your knees flex, move and walk with ease. So what is this trace mineral? It's boron. Study after study shows that people with knee and joint problems tend to have very low levels of this underrated nutrient. Boron is found in multivitamins, but only in tiny amounts. And the vast majority of boron supplements don't absorb very well. That's why Ultimate Knee Relief includes a new breakthrough that dramatically increases the bioavailability of boron and gives you fast, soothing relief. It's a patented form of boron called Calcium Fructoborate. Research shows that Calcium Fructoborate helps your body metabolize 70% more calcium, magnesium and antioxidants. Why is this important? Because it gives you better range of motion…better relief from inflammation…and better protection against free radicals that can damage your hard-working knees! In one study, people with knee pain were given either calcium fructoborate or a placebo. They were then measured on various markers of inflammation and pain. What's more, the Calcium Fructoborate was well-tolerated and achieved significant benefits for just about everyone taking it! The Calcium Fructoborate worked so well, in fact, that 75% of the people taking it were able to decrease the amount of other pain remedies they were taking! Ultimate Knee Relief gives you 216 mg of Calcium Fructoborate—the clinically effective amount. Ultra-Concentrated White Willow Bark, Meriva, Super Boswellia and Calcium Fructoborate are 4 of the most effective nutrients to help eliminate persistent knee pain. But even so, I didn't stop there. You see, another way to soothe aching knees is to rebuild the cartilage and tissues that have become damaged over the years. That's why Ultimate Knee Relief includes 2 more nutrients. They are the most widely-studied joint supplements on the planet—and you may have even tried them yourself. But we've found a way to make them even more powerful and effective. If you have aching joints anywhere in your body, you are probably familiar with glucosamine. Glucosamine gives your joints the physical "building blocks" they need to maintain the structure and function of your cartilage. Inside your joints, this nutrient actually feeds the cartilage-building cells so they function better. Plus, it can suppress harmful enzymes that break down cartilage in the first place. Meanwhile, chondroitin helps your cartilage retain water, so you can run, walk and flex your knees without pain. It also acts as a natural anti-inflammatory that can reduce swelling and tenderness. While glucosamine and chondroitin deliver great benefits individually - research shows they work best as a team. Especially when it comes to knee joints! You see, over the years, wear and tear on your knees causes the space between your cartilage and joint to narrow. It means your cartilage is thinning out…and you're running out of the natural lubrication that keeps your joints smooth and comfortable. That's what causes that crushing "bone-on-bone" pain. Glucosamine helps increase the "space" between your knee joints. And chondroitin fills this space with healing lubrication. The result? Less joint degeneration…less swelling and tenderness…and more soothing relief. Ultimate Knee Relief contains 750 mg of glucosamine and 200 mg of chondroitin - the clinical levels shown to deliver the best results. However, glucosamine and chondroitin take a while to work, since they have to build up in your system. So we've actually found a way to help this nutritional duo work better and faster. Studies show that when you combine them with calcium fructoborate, you can turbocharge the results! "Decreased pain scores dramatically …"
In a brand new study, scientists divided people with knee pain into three groups. Group 1 took a placebo. Group 2 took glucosamine and chondroitin alone. 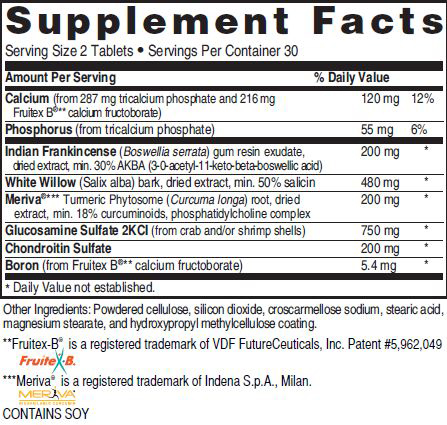 Group 3 was given glucosamine and chondroitin - along with calcium fructoborate, the ingredient I mentioned a moment ago. Before the study, the scientists measured the severity of knee pain in all the participants. They assessed pain scores again after 7 days, then again after 14 days. At the end of the 2-week study, the researchers found that this triple-nutrient combination of glucosamine, chondroitin and calcium fructoborate improved knee pain and flexibility much more than the other two groups! As you can see, only Ultimate Knee Relief provides you with 6 of the most effective pain-stoppers to support healthy, flexible knees and end your discomfort. Plus, they're included in the therapeutic levels shown in studies to deliver the most health benefits. Other Ingredients: Powdered cellulose, silicon dioxide, croscarmellose sodium, stearic acid, magnesium stearate, and vegetable cellulose coating. ***Meriva®, is a registered trademark of Indena S.p.A, Milan. Why suffer with stubborn knee pain and stiffness a moment longer? What's more, Ultimate Knee Relief is the only supplement exclusively formulated to soothe and support your hard-working knees - and keep them flexible and pain-free for as long as you keep using it. Trade in your aching knees for a fresh new start! Imagine—just a few days from now—instead of waking up feeling stiff and sore, you'll jump out of bed ready to enjoy an exciting, pain-free day. Imagine being able to take long walks with your friends, play on the local softball team, and remain independent and enjoying life well into your 80s and 90s. Imagine gardening or fixing things around the house without worrying about your aching knees later! That's what life promises for you with Ultimate Knee Relief. And why I urge you to give it a try. You've seen the rock-solid evidence behind our turbocharged form of white willow bark and how it can start to relieve even the most persistent knee pain in as little as one hour. You've also seen how Meriva, super boswellia, calcium fructoborate, glucosamine and chondroitin all work as a powerful team to support healthy, flexible and pain-free knees. Ultimate Knee Relief can make the difference between living life to the fullest, or staying on the sidelines because you hurt too much. Instead, you can fix your knees, ease your pain and carry on with your life! Can you purchase all these nutrients separately? Sure. But you'll probably have a hard time finding all of them at your health food store—especially our exclusive 50% salicin white willow bark. Even if you can find these ingredients, you could easily pay over $130.00 for a one month supply. Plus, there's no guarantee you would find them in the right therapeutic levels or in the most advanced forms shown to deliver the best results. But Ultimate Knee Relief gives you all 6 ingredients in one exclusive formula—and for far less than the price of your morning cup of coffee! A one-month supply of Ultimate Knee Relief is just $39.95, plus $6.95 shipping and handling. But you can save $12 when you try a 3-month supply. You'll pay just $35.95 a bottle. That's $107.85 total plus $6.95 shipping and handling. For the Biggest Savings and the Lowest Price per Bottle try the Six Month Pack and Save $40.20 off the regular price and get Free Shipping! If you want to keep your knees flexible and pain free over the long run, I urge you to consider the six-month supply. You pay just $199.50 or $33.25 per bottle. Plus shipping and handling is free! That's a total savings of $47.15. "Down to the Last Tablet" Money-Back Guarantee! When your supply of Ultimate Knee Relief arrives, I want you to use it, without risking a cent. Because it is backed by my "Down to the Last Tablet" Money-Back Guarantee. Or if you're not satisfied for any reason, then return the empty bottle - even if you're down to the last tablet - for a full refund. No hassles, no questions asked. You only pay return shipping. However, I bet you won't do that. Because if you're like most people you'll feel so much better you'll never want to stop taking it! I couldn't make this promise if I wasn't sure that Ultimate Knee Relief will work for you. Just follow this link or call us toll-free at 1-800-791-3395 to have Ultimate Knee Relief rushed right to your door. Our health consultants are available to help you 24 hours a day, seven days a week. Can pain-free knees really be this easy? Yes they can! Wouldn't it be great to dance, walk, and live every day to the fullest without worrying about stiff, aching knees getting in your way? Then please order your risk-free supply of Ultimate Knee Relief today. It's the easiest, safest, and most effective way to end your days of sitting on the sidelines and start enjoying a happy, active life again. PS: Remember, you are protected by our Down-to-the-Last-Tablet Guarantee. If you don't feel a dramatic difference with Ultimate Knee Relief, simply return the bottle—empty or not—within 90 days for a no-hassle refund. That's about as risk-free as it gets! So please follow this link now, or call Advanced Bionutritionals at 1-800-791-3395. And remember, you're fully protected by our 100% Down-to-the-Last-Tablet Guarantee! ACT NOW! Order Your Ultimate Knee Relief Today!